So we’ll have to wait five months before we can enjoy wandering through the Albany Farmers’ Market once again. 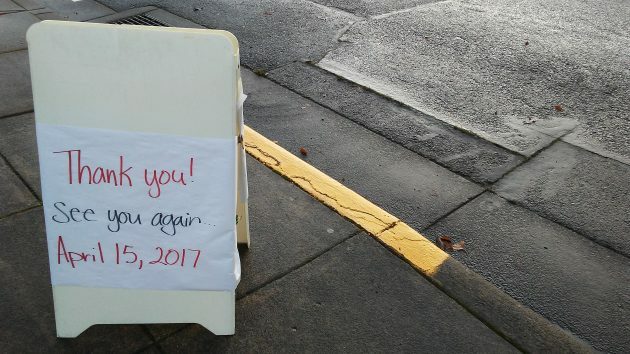 Saturday was its last day for 2016, and as the sign said, it won’t reopen until the third Saturday next April. I don’t blame the Corvallis-Albany Famers’ Market organization for suspending operations during the winter. (The last day in Corvallis is Wednesday.) Who wants to stand out there in the cold and the rain, waiting for customers who also would rather stay where it’s warm and dry? By Saturday, the number of vendors in Albany had shrunk to less than half the usual number. 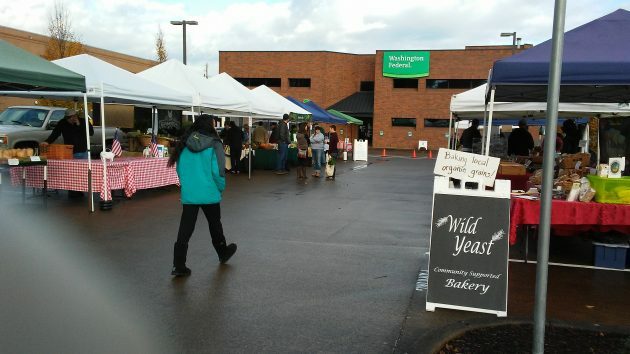 And the place, in the parking lot outside of City Hall, was kind of short of potential customers as well, even though the stands that were there still had plenty of locally grown, baked or otherwise made stuff to sell. I’ve said this before, and I still think it would be nice to have a wintertime venue where growers and crafts people could, on Saturdays, show and sell local products available during the off-season. But I’m mindful that setting up stalls and staffing them amounts to a lot of work, and maybe we’re not a big enough town to make a year-round operation worthwhile. It looked like a slow day at the Albany Farmers’ Market on its last day of the year.